If you are searching for an environmentally-friendly apartment in Wichita, Bokeh Development offers LEED certified apartments in Wichita at The LUX! Our downtown Wichita LEED certified apartments are sustainable and focused on saving energy and water. 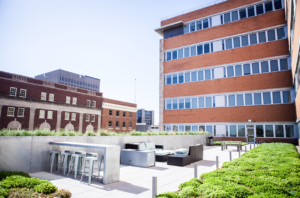 The LUX LEED certified apartments in downtown Wichita are designed to lower operating costs, be a healthier and safer option for occupants, reduce harmful greenhouse gas emissions, save energy and water, and reduce waste sent to landfills. Make yourself at home in a LEED certified apartment! Our LEED certified apartments have interiors made up of recyclable and green materials and resources, including translucent walls and bamboo floors in apartment units. We also improve indoor quality and energy efficiency through better insulation, improved daylighting design, and high-efficiency HVAC systems. If you are interested in a LEED certified apartment, don’t hesitate to contact us to learn more. You can also take a look at our available LEED certified apartment units at The LUX here.